The Boeing 787 Dreamliner is a twin-engine, long-haul jetliner manufactured by Boeing Commercial Airplanes. Boeing Business Jet (BBJ) aircraft are variants of Boeing jet aircraft for the business aircraft market. 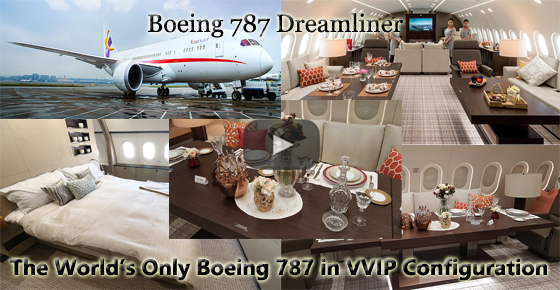 Leading international business aviation group, Deer Jet, has outsourced the global "Dream Jet" charter, the only BBJ 787 in the world, to its strategic partner, UAS International Trip Support (UAS) with VVIP configuration. Deer Jet took over the management of the first 787 Dream Jet in the world. It took more than two and a half years of work for the renowned French interior designer, Jacques Plerrejean, and the aircraft completion center to create this masterpiece of aerospace crafts.